Anneka appears as a regular guest on UK news and current affairs shows including Good Morning Britain, BBC News, Channel 5 News, ITV and Sky news where she is invited to discuss topical wildlife news items, canids and animal rescue. Most recently she is filming with Channel 5 on new show When TV Animals go horribly Wrong. Anneka’s love and expertise for animals has always intertwined her professional life, having originally started to train as a Vet before embarking on drama school and a degree in Environmental Studies, Drama and Film. Anneka writes for many animal & ethical magazines including The Huffington Post, The Ecologist, Dog’s Today, K9 Magazine, Barefoot Vegan, VegFest Express & Veganuary; worked on TV shows featuring Steve Irwin, as well as co-founding a dog rescue charity in 2011. Over the last three years, Anneka has rescued and rehomed hundreds of dogs from all over the world and appeared in many newspaper articles and blogs about her rescue and charity work. Anneka founded ‘Green World Television‘ and ‘Angels for the Innocent Foundation’ in 2014 in order to intertwine her film making abilities with her animal conservation work, her passion being to help animal charities who struggle with film making and to be one of the fore runners in reporting on wildlife crime. Anneka now produces strong films & campaigns, some created to give animal and environmental charities a much needed voice in the world of television. She also produces and fronts important documentaries which draw light to issues surrounding planetary destruction and wildlife conservation. Her facebook TV platforms have a combined following of over 661,000 followers worldwide and her weekly online wildlife show ‘Animal Watch‘ has amassed over 172,000 subscribers in 2 years alone. Her film ‘Heartbreak to Happiness’, produced for Raystead Animal Rescue, was nominated for the Charity Film Awards 2017. Anneka has in total produced & filmed over 200 short films to date for various conservation and charitable projects across the world including the National Badger Day Official Film ‘Talking Badgers’ alongside Bill Oddie, Steve Backshall, Nigel Marven, Chris Packham and Virginia McKenna; The official World Animal Day Film, LionAid Live, Mayhew’s Bark in the Park, been the live compère for The National & London Pet Shows, Expert Dog Judge on Superdogs Live with SuperVet Noel Fitzpatrick, created short films for Wildlife Trusts’ ‘Wildlife Watch’, filmed alongside Will Travers of Born Free, written for The Eden Channel website, produced the official trailer for BirdFair and WolfWatchUK, been the official presenter and film maker for VegFestUK and presenter for the green Pea Awards. Anneka has also come on-board as one of Whalefest Live’s main presenters and in 2016 she filmed with The Dog’s Trust, as well as a powerful conservation documentary on the all female South African anti-rhino poaching unit ‘The Black Mambas‘ for Helping Rhinos, produced by Nigel Marven and Image Impact Films. Anneka has also been the live host at events for The Environment Trust. 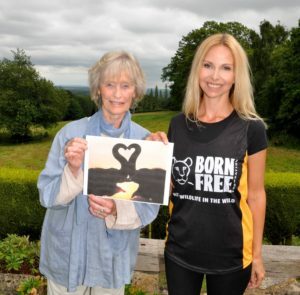 Anneka is patron To The Born Free Foundation, World Animal Day & The Fox Project. She is also ambassador to Wetnose Animal Aid & WolfWatchUK. “I have known and worked with Anneka Svenska for several years and have always admired her focussed and articulate approach to the issues she highlights. She is not afraid to take on controversial issues, and her focus on wildlife and environmental matters provides a strong voice to challenge those who seem to wish to consume rather than conserve. Furthermore, she understands her subject well and this means her presentations and interviews are informed by thorough and intelligent research. She comes across very well, and is excellent on screen.